Cauleen Smith is an interdisciplinary filmmaker whose work is rooted in a mid-twentieth century experimental film framework. She uses science fiction, third world cinema, and structuralism, to make “things that deploy the tactics of these disciplines while offering a phenomenological experience for spectators and participants.” Her work has shown nationally and internationally, both solo and in group exhibitions. Originally born in southern California, she was raised in Sacramento. She earned her bachelor’s degree from San Francisco State University and her MFA from UCLA School of Theater, Film and Television. 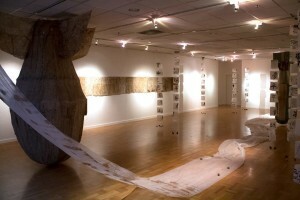 Currently, she is faculty at Vermont College of Fine Arts low-residency MFA program. This interview was conducted via email in November 2017. Jazmyn Wright: How did you discover your interest in filmmaking? Did you ever want to do anything else? Cauleen Smith: Filmmaking incorporates every kind of media and performance style and invents a few that are unique to its form. It’s very satisfying to use film to make art. I’ve always been a creative person, but filmmaking was something I stumbled on. I’m glad I did. JW: Do you describe yourself as a feminist filmmaker? What does feminist filmmaking mean to you? CS: The word feminist is a loaded term because when white women use the term they sometimes are not considering the conditions and stakes of a feminist identity for women of color or poor women or women with varying abilities. And this prompts a lot of people to avoid the word feminist. I’m fine with the word. It’s just a word. It’s all about action and ethics. JW: You clearly identify what feminism means to you, I just wanted to clarify whether you had a specific definition for feminist filmmaking? Do you see a difference between a feminist film and other types of films? Do you think a film has to include specific elements to be considered feminist? JW: Would you describe yourself as an experimental filmmaker? How do you define experimental filmmaking? CS: Yes, experimental filmmaking is a discipline and practice that operates through questions and forms and structures rather than narratives and characters and plot. This is not to say that experimental films don’t have those things, simply to say that in experimental film the narrative, character and plot do not determine the form of the film. Editing, color, materials, and sound become subjects in and of themselves in experimental film. JW: Where do your ideas for your films come from, for example Crow Requiem? CS: I think filmmaking is always about engaging with the world around us. The cues to the things that Crow Requiem is pointing to are right there in the film as well as in the films relationship to American history. JW: You say the “things that “Crow Requiem” is pointing to are right there in the film.” The film is kind of dark. Between the bare trees and the crows and other aspects, the first thing my mind goes to is “Strange Fruit” and lynching in the Jim Crow south, but that might be a little too grim. Can you expound a little more? CS: Some elements in the film that may not be obvious are the radio still lives which are taken from John Carpenter’s movie The Fog (listed in the credits). The aesthetics of that film spoke directly to the images coming from protests in Ferguson, MO. There is a lot of information to be gleaned from the soundtrack and music as well (also listed in the credits). JW: What is your filmmaking process? For example, once you had the idea for “Demon Fuzz”, a film I particularly enjoyed for its geometric visuals, how did you go about creating it? CS: Oh, I just made that for fun as a fan video. I love that band Demon Fuzz and that song is amazing. So it was just fun to use the mirror filter and make something hypnotic and light. I think the mirror filter is overused all the time, so that video is a bit of an indulgence. JW: In “Triangle Trade” you do not hide the puppeteers. What is the significance? Is it meant to be self-reflexive? CS: We are using a puppeteering style based on the Bunraku style of puppeteering. Each artist made a puppet that was supposed to represent them. The audience is asked to reckon with the mirroring between the puppet and the operator. JW: You mention the Bunraku style of puppeteering. As I understand it Bunraku is a 17th century traditional style of Japanese puppet theater. Is there anything else that should be known about it to better understand the piece? CS: The reason I made them is because I thought that film was a good form for the ideas I was interested in. In order to grapple with the ideas you would have to watch the films with the intent of applying what can be known to what you see. The narrative is not repeated in simple language, three times like in television shows. There is no spoon-feeding. The viewer is assumed to be an active agent. JW: In a 2011 interview with “BOMB Magazine” you said, “narrative-movie audiences are becoming more passive; they’re refusing to meet images halfway.” Can you expound? What does it mean to meet an image halfway? CS: I feel that audiences should always be attempting to understand the aesthetic and formal decisions that a filmmaker is using to make meaning. The desire to have everything explained, unambiguous and easily digestible limits the spectator from actually engaging with the ideas in a way that leads to self-examination. I believe that expecting every film image to be explained and clear, well that is more like wanting to consume advertising or propaganda than art. That’s a spectator who wants to be told things and experience pleasure. Sometimes wrestling with ideas is not immediately pleasurable. And often art shows us things about ourselves that we do not like. Advertising and propaganda never do this. Art cannot tell someone what to think, it can offer pathways and ideas for the viewer. JW: Experimental films can be ambiguous at times. With your last response in mind, when making a film such as “Chronicles Of A Lying Spirit By Kelly Gabron”, do you want your audience to walk away with a specific understanding, or do you want them to interpret it for themselves? CS: Hopefully both things can happen. JW: It was enjoyable getting to converse with you and learn more about your work and filmmaking process and thank you again for participating in this interview. CS: Thank you, and best of luck. To see more of Cauleen Smith’s work, you can connect to her Vimeo via this link. The artist and filmmaker Cauleen Smith, who recently relocated from Chicago to Los Angeles, rarely tethers her work to bare reality. Her latest film, Triangle Trade, 2017—made in collaboration with Canadian artists Jérôme Havre and Camille Turner—renders three new, fantastical realms, inhabited only by the puppet likenesses of the work’s three creators. Triangle Trade is on view at Gallery TPW in Toronto until November 11, 2017. TWO YEARS AGO, I visited Toronto to do a site visit at Gallery TPW, where I had been slated to have a solo exhibition. I wanted to make a film in the city for that show, so I started meeting with a lot of black artists living in Toronto, hoping to find a few collaborators. I became really intrigued by many of these artists’ ideas about blackness; I sensed a lot of frustration about how whenever black history or experience is discussed, it’s always from an American point of view. But there’s a long history of black people emigrating from the Caribbean to Canada, which seems to create a kind of double colonial consciousness—an echo in terms of belonging and not belonging. Ultimately, I chose to collaborate with the performance and multimedia artist Camille Turner and the sculptor Jérôme Havre. So much of Camille’s work is made through a speculative, science-fiction lens, and she loves to use Afro-Futurist metaphors to talk about alienation. It became clear we’d be able to have a very natural conversation within a project. And I just thought Jérôme’s work was so fresh—I had never seen anything like it. He was making things that—to me—were, crucially, not like anything that an American artist would make. For example, Magnifique Isolation, 2009, was a stunning installation that he made of small, distorted human figures that hung from the ceiling, suspended in midair. I can’t really think of any African American artist who would hang a body. That decision was so intriguing, because it shows how the weight of history always presses itself upon aesthetic decisions. I have to stress that our film, Triangle Trade, is equally mine, Camille’s, and Jérôme’s. Each of our segments in the film function independently of one another, and our respective puppets never really engage in dialogue. Even the terrains and topographies of our separate segments remain really distinct, which might, in some way, be symptomatic of the black diasporic condition. My segment takes place on a volcano. My puppet talks about how it’s impossible for anyone to claim one, because it’s literally made up of matter coming from the core of the earth. I’ve been thinking about that concept a lot lately, and about how North American land is completely soaked in blood. It’s become increasingly troubling to me, especially when I try to imagine futures or forms of liberation or justice. New land seems necessary, but, of course, all the land everywhere has been claimed and colonized many times over. I thought about other planets, but there’s a strange colonial project in that too. So, really, the only place you can arrive at and settle in without doing harm is at a lava berg. The terrain in Camille’s segment is a completely imaginary and allegorical world. It looks nothing like Earth, and she describes it only in magical terms, rather than empirical ones. Jérôme’s is an island, but, more than that, it’s a kind of meta-space or feeling—the feeling of being adrift. It was an important challenge to create Triangle Trade together without necessarily agreeing on what time or space we were in. I think that’s an interesting lesson on how to get along with people in general. You may not all have agreements on where, and when, and who we are. Featured image: Jérôme Havre, Cauleen Smith, and Camille Turner, Triangle Trade, 2017, HD video, color, sound, 14 minutes 31 seconds. In conjunction with The Gallatin Climate Change Initiative: A Conference, which will run from September 14-15,2017, NYU Gallatin’s, The Gallatin Galleries will present the exhibition From Outrage to Action, which includes work from artists, journalists, and scientists, all of whom seek to address and act on the issue of climate change. Artists Reception Monday, September 18, 2017, 6-8pm. The title of this piece is taken from William Butler Yeats’ poem, The Second Coming, excerpted below. 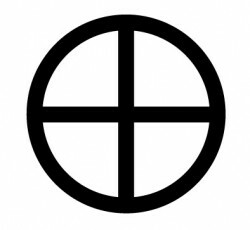 The projected image, , is a newly introduced international symbol for extinction. The sunken image, , is a recognized international astronomical symbol for Earth. The artists will be replacing the block of ice each day throughout the weeklong exhibit, at approximately 3:00pm, except for Sunday, September 17th. Grayson Earle’s diverse technological practice is unified by a political approach to media making. Employing video games, video projection, algorithmic audiovisual generation, biological organisms, and robotics, his work tends to intervene on physical spaces and entrenched ideas. His creative practice articulates a repositioning of resistance to power that invites participation from reluctant citizens. Earle (b. 1987) lives and works in Brooklyn, NY. He teaches at Hunter College, split between the Computer Science, Film and Media, Integrated Media Arts, and Studio Art MFA programs. This interdisciplinary posture is emblematic to his work as an artist, and is an approach he proselytizes in his courses on game programming, electronics, and generative art. Mark Read is best known as the artist-activist that produced the “Occupy Wall Street Bat Signal” in November of 2011. Subsequent to that projection-intervention Read initiated The Illuminator project, which has gone on to produce hundreds of projection-interventions around the world. The Illuminator’s work has received wide acclaim from both social activists and the art world. Their work has been featured in academic publications such as Public Art Dialogue, and exhibited in galleries and museums, including the Brooklyn Museum. In 2016 The Illuminator was Artist in Residence at the Hemispheric Institute for Performance and Politics. Read teaches courses on art and politics at New York University, where he is employed as an adjunct professor. Light Work is pleased to present the work of photo-collage and video artist Suné Woods, To Sleep With Terra. This will be Woods’ first solo exhibition with Light Work since her residency here in 2016. The exhibition will be on view in the Kathleen O. Ellis Gallery at Light Work from August 28―October 19, 2017, with an opening reception with the artist on Wednesday, September 13, from 5-6pm. As part of the opening reception, we invite gallery patrons to a special presentation at 6pm. Infused with wordplay, found imagery, sound and moving images in multimedia form by Woods, award-winning poet Fred Moten, and Syracuse University Professor and musicologist James Gordon Williams. Titled You are mine. I see now, I’m a have to let you go, this collaboration was generously supported by Syracuse University’s Humanities Center and is part of the 2017-18 Syracuse Symposium: Belonging. Both events are free, open to the public, and offer refreshments. Urban Video Project (UVP) will feature Suné Woods’ video work, A Feeling Like Chaos, concurrently with When a Heart Scatter, Scatter, Scatter in the Everson’s Robineau Gallery and To Sleep with Terra at Light Work. Woods says that A Feeling Like Chaos “attempts to make sense of a continuum of disaster, toxicity, fear, and a political system that sanctions violence towards its citizens.” This installation will be on view on the Everson Museum’s north facade September 14―23 and October 5―28, 2017, from dusk until 11:00 p.m. Find more information at urbanvideoproject.com. 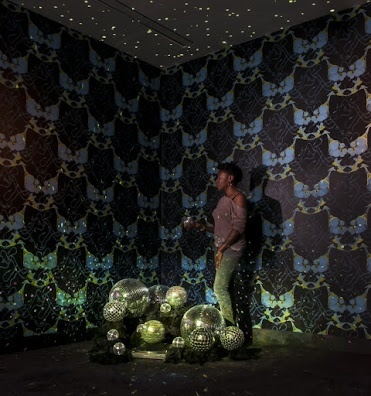 Los Angeles-based artist Suné Woods creates multi-channel video installations, photographs, sculpture, and collage. Her practice examines absences and vulnerabilities within cultural and social histories. She also uses microcosmal sites such as the family to understand the larger sociological phenomenon, imperialist mechanisms, and formations of knowledge. She is interested in how language is emotively expressed, guarded and translated through the absence and presence of the physical body. 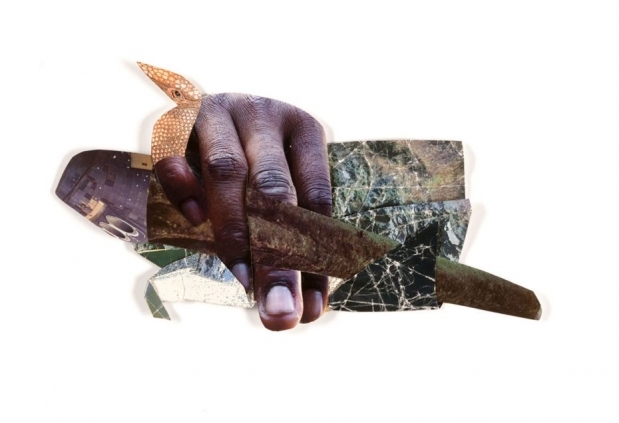 To Sleep With Terra includes photo-collage and works on paper that explore Wood’s ongoing interest in creating her own topographies, gleaned from science, travel, and geographic magazines and books of the past fifty years. The collage work explores the social phenomena that indoctrinate brutality and the ways in which propaganda and exploitation have employed photography. Suné Woods has participated in residencies at Headlands Center for the Arts, Vermont Studio Center, The Center for Photography at Woodstock, and Light Work. Woods has received awards from the Visions from the New California Initiative, as well as The John Gutmann Fellowship Award, and The Baum Award for an Emerging American Photographer. She has exhibited her work at the Brooklyn Museum of Art, The Lowe Art Museum, Miami, and The San Francisco Arts Commission Gallery. She received her MFA from California College of the Arts in 2010 and is currently Visiting Faculty at Vermont College of Fine Art. Gallery TPW is thrilled to announce an upcoming exhibition featuring Jérôme Havre, Cauleen Smith, and Camille Turner, a new commission made possible with the generous support of Partners in Art. Created during a year of cross-border conversation on their specific relationships to land and belonging, Havre, Smith, and Turner have collaborated on a new short film that will premiere at TPW. The film features three puppet avatars—performing the selves of Havre, Smith, and Turner—navigating distinct worlds that at once isolate them and offer them the possibility of transformative connection. 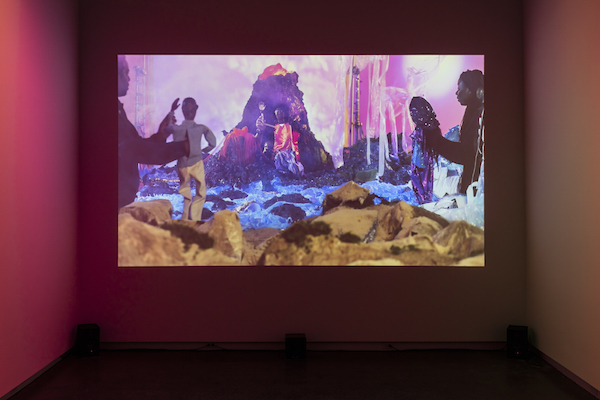 As they move through their respective landscapes, Havre, Smith, and Turner’s puppets reflect on blackness as a state of becoming, a mode of experience that reaches simultaneously into multiple futures and histories. The film is accompanied by a new multi-channel CCTV video installation developed by Smith that creates feedback loops of seeing and being seen amid an immersive environment. Alongside the project, Toronto-based writer Yaniya Lee joins Gallery TPW as a guest curator of public programs for the course of the exhibition. Lee will engage local Black artists and thinkers as a parallel to the ongoing conversations that have prompted Havre, Smith, and Turner’s work. In addition to the vital support of Partners in Art, this exhibition is made possible with the assistance of the Liaison of Independent Filmmakers of Toronto (LIFT). Jérôme Havre’s practice concentrates on issues of identity, communities, and territories, investigating the political and sociological processes of contemporary life as they relate to nationalism in France and Canada. 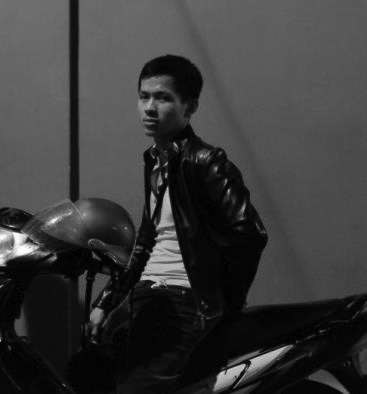 Havre adopts a multidisciplinary approach in his exploration of these themes and their attending questions; he uses myriad tools and methods to make tangible the conditions of identity within situations of social transformation. Havre completed his studies at l’École Nationale Supérieure des Beaux-Arts (Paris). Since 2001, he has exhibited in Europe, Africa, and North America. Recent shows include “Talking Back, Otherwise,” Jackman Humanities Institute, University of Toronto; “Paradis: La fabrique de l’image,” espace d’art contemporain 14°N 61°W, Martinique; “Land Marks,” Art Gallery of Peterborough, Ontario; “Liminal (Necessity and accident),” The Robert McLaughlin Gallery, Oshawa, ON; “Reiteration,” Art Gallery of Ontario, Toronto;  and “Poetry of Geopolitics,” Koffler Gallery, Toronto. He is represented by Galerie Donald Browne (Montréal) and is currently based in Toronto. Cauleen Smith is an interdisciplinary artist whose work reflects upon the everyday possibilities of the imagination. Operating in multiple materials and arenas, Smith roots her work firmly within the discourse of mid-twentieth-century experimental film. Drawing from structuralism, third-world cinema, and science fiction, she makes things that deploy the tactics of these disciplines while offering a phenomenological experience for spectators and participants. Smith was born in Riverside, California and grew up in Sacramento. She earned a BA in Creative Arts from San Francisco State University and an MFA from the University of California, Los Angeles School of Theater, Film, and Television. Smith is currently based in Chicago; she will join the faculty of the studio-art program of California Institute of the Arts in January 2018. Her films, objects, and installations have been featured in group exhibitions at the Museum of Contemporary Art, Chicago; the Studio Museum in Harlem; the Contemporary Art Museum Houston; the Yerba Buena Center for the Arts; the New Museum, New York; D21, Leipzig; and Decad, Berlin. She has presented solo exhibitions of her films, drawings, and installations at the Center for Contemporary Art and Culture, Portland, Oregon; the Contemporary Arts Center, UC Irvine; the Art Institute of Chicago; The Kitchen, New York; the Museum of Contemporary Art Chicago; and Threewalls, Chicago. Smith is the recipient of several grants and awards, including the Rockefeller Media Arts Award, a Creative Capital Film/Video grant, a Chicago 3Arts Grant, a the Foundation for Contemporary Arts grant, the Artadia Award, and a Rauschenberg Residency. Smith was a 2016 Recipient of a Herb Alpert Awards in the Arts in Film and Video and is the inaugural recipient of the Ellsworth Kelly Award. She was a Whitney Biennial 2017 participant and currently has a solo show at The Art Institute of Chicago. Smith is represented by Corbett vs. Dempsey, Chicago, and Kate Werble, New York. Born in Jamaica and based in Toronto, Camille Turner is an explorer of race, space, home, and belonging. She is the founder of Outerregion, an afrofuturist performance company. Her interventions, installations, and public engagements combine Afrofuturism and historical research and have been presented throughout Canada and internationally, including at Dak’Art African Contemporary Art Biennale, Dakar Senegal, and the Bamako Biennale in Mali. Miss Canadiana, one of her earliest performance works, challenges perceptions of Canadianness and troubles the unspoken binary of “real Canadian” and “diverse other.” Camille’s most recent works include Wanted, a collaboration with Camal Pirbhai that uses the trope of fashion to transform an archive of newspaper posts by Canadian slave owners into a series of contemporary fashion ads. Her collaboration with Cheryl L’Hirondelle on LandMarks2017, commissioned by Parks Canada and Partners In Art, resulted in Freedom Tours, an alternative Thousand Islands boat tour and a procession honouring Mother Earth at Rouge National Park. Camille has taught at the University of Toronto, Algoma University, and the Toronto School of Art. She is a graduate of Ontario College of Art and Design and York University’s Masters in Environmental Studies program, where she is currently a PhD candidate. Her work has recently been included in More Caught in the Act, edited by Johanna Householder and Tanya Mars, Looking Beyond Borderlines: North America’s Frontier Imagination by Lee Rodney, and Border Cultures by Srimoyee Mitra and Bonnie Devine. camilleturner.com. Yaniya Lee’s interdisciplinary research draws on the work of Black Studies scholars to question critical reading practices and reconsider Black art histories in Canada. From 2012-2015 she hosted the Art Talks MTL podcast, a series of long-form interviews with art workers in Montreal. In 2016 she programmed “Labour, Land and Body: geographies of de/colonialism” for Vtape’s Curatorial Incubator. Last fall, with members of the 4:3 Collective, she organized the MICE Symposium on Transformative Justice in the Arts. Lee was previously on the editorial advisory committees for C Magazine and FUSE Magazine. She is a founding collective member of MICE Magazine and a new member of the EMILIA-AMALIA working group. This summer, Lee participated in the Banff Research in Culture: Year 2067 residency. She is the 2017-2018 writer-in-residence at Gallery 44 and currently works as the associate editor at Canadian Art Magazine. Image courtesy of Cauleen Smith. This project is made possible with the generous support of Partners in Art and the Liaison of Independent Filmmakers of Toronto. 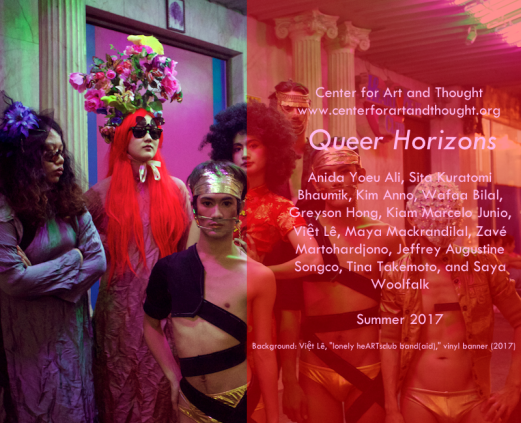 Contributors: Anida Yoeu Ali, Sita Kuratomi Bhaumik, Kim Anno, Wafaa Bilal, Greyson Hong, Kiam Marcelo Junio, Việt Lê, Maya Mackrandilal, Zavé Martohardjono, Jeffrey Augustine Songco, Tina Takemoto, and Saya Woolfalk. Contributors’ works are published in staggered waves from late-June to late-July 2017, after which the whole exhibition are archived permanently on CA+T’s website. Special thanks to the Andy Warhol Foundation and the California Institute of Contemporary Arts for fiscal support. 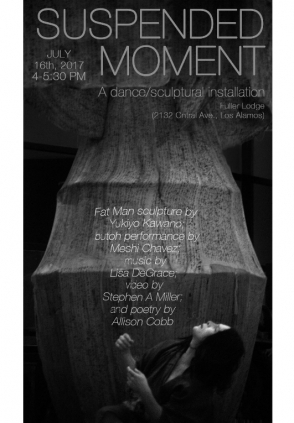 On the anniversary of the world’s first atomic test Suspended Moment, a sculpture installation and Butoh dance and poetry performance by Los Alamos native Allison Cobb, Hiroshima native Yukiyo Kawano, with Butoh choreography/dance by Meshi Chavez, soundscape by Lisa DeGrace, and video projections by Stephen A. Miller, will be performed in Los Alamos, NM. Los Alamos History Museum, Los Alamos/Japan Project, and Los Alamos County Library System. Funded in part by a grant from the New Mexico Intervention Fund of the National Trust for Historic Preservation. 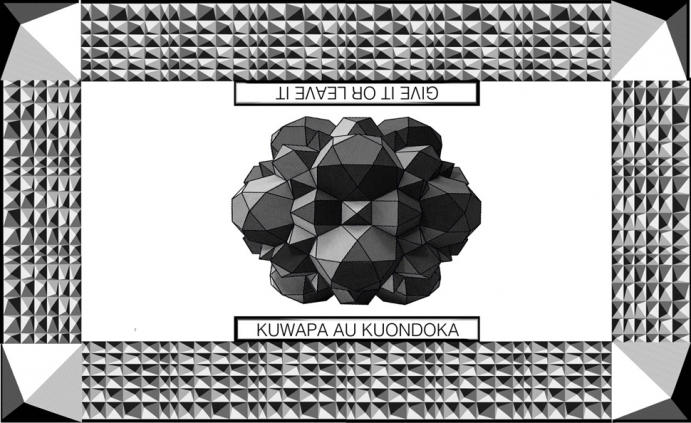 Additional Funding: Kawano has received a Career Opportunity Grant award from the Oregon Arts Commission. The performance takes place from 4-5:30 p.m. at Historic Fuller Lodge, 2132 Central Ave., Los Alamos, NM 87544.